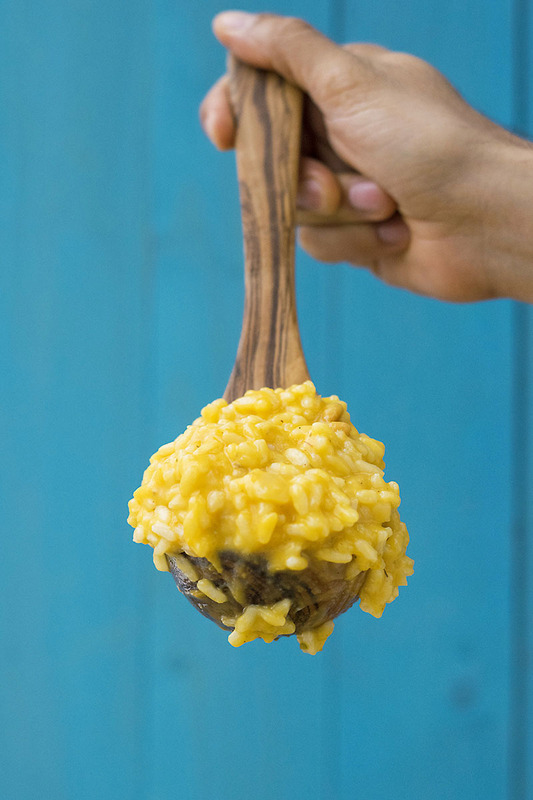 This light and creamy butternut squash risotto is the perfect fall recipe! It is served with roasted pine nuts and mushroom chips. Am I late to join the talk about meatless fall dinners? The weather here is still pretty warm, at least during the day because as soon as it gets dark you can certainly feel the chill in the air. And of course, pumpkins and squash are starting to appear everywhere, so what better way to use them than in a light and creamy butternut squash risotto? And I know I don’t have to point this out, but this recipe will work just fine with any type of squash or pumpkin happens to be your favorite. When I have the time I prefer to make my own squash or pumpkin puree. I have found that to get a tasty homemade pure with nice depth of flavor you must bake the squash for a long time until well browned and caramelized. That’s where all the flavor hides, and that’s why I do it with the cut-side facing up and not down like some recipes suggest. I also like to add a teaspoon of light brown sugar and a pinch of salt to the puree, just to intensify the taste. 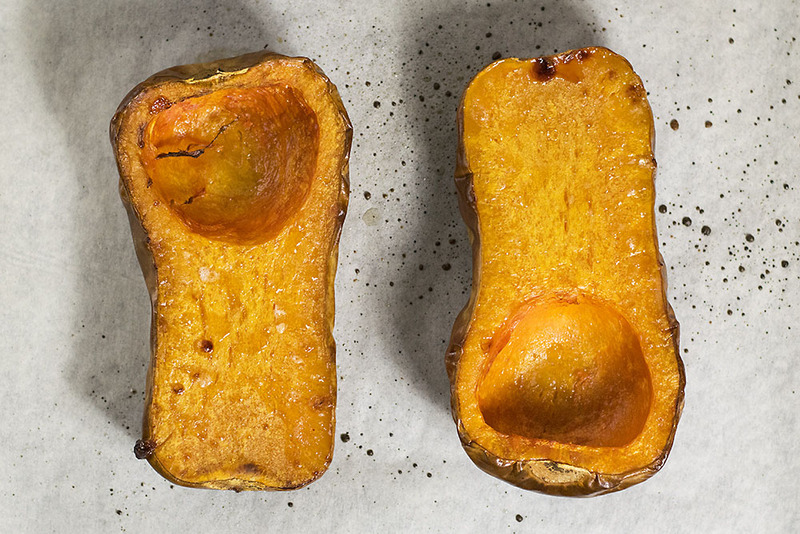 Cut your butternut squash or pumpkin in half and remove seeds by scraping them with a spoon. If your squash is pretty big, you can cut it in smaller pieces to maximize the surface of caramelization. Lightly brush with olive oil and bake for about one hour or longer, until the flesh is soft with a golden/deep brown surface. Remove from oven and let it cool a little. Scrape the flesh with a spoon and transfer into a food processor. Add 1 teaspoon light brown sugar and a quarter teaspoon salt (you can always add more later!) and process until everything is smooth. 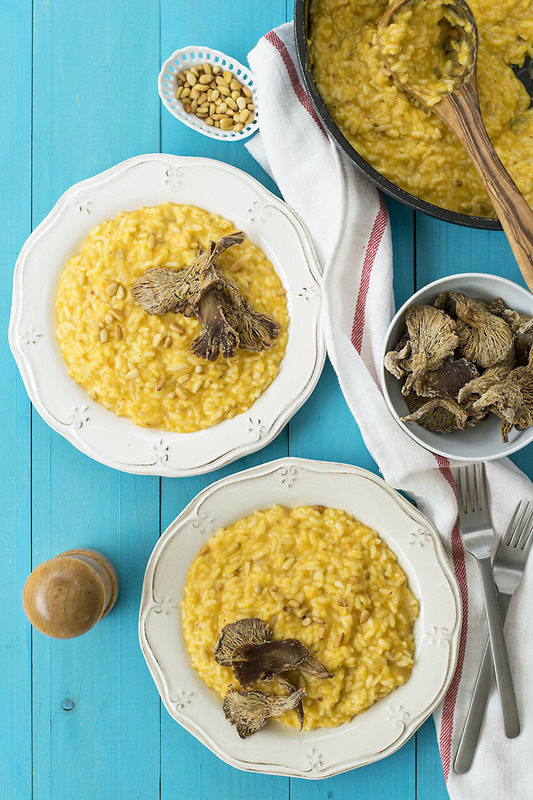 Mushroom chips are my favorite way to garnish this risotto, but they’re also a delicious snack on their own. 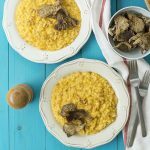 I’ve made them before for this gluten-free and vegan pumpkin soup so I knew that they would pair really well with this risotto also. All I can say is that they are highly addictive (!) and once you start eating them there’s no way of stopping. It’s like they’re filled with umami flavor. The recipe works best with oyster mushrooms, but you can try it with any other mushroom type you like, as long as you cut them into thin slices (approximately 1/8 inch thickness). Take about 1 pound oyster mushrooms, separate each one from the bunch and tear the larger mushrooms by hand into smaller pieces. Try to end up with pieces of the same size. Transfer into a large, clean plastic bag or zip log bag and sprinkle with a pinch of salt, a pinch of thyme (optional) and about 1-2 tablespoons olive oil. Close the bag and shake gently. Add two tablespoons flour into the bag and shake once more to lightly coat them with the flour. Line with baking paper a baking pan and transfer the mushrooms in a single layer, the one next to the other. Bake them for about 1 hour or until deep brown and crispy. Remove from oven and let them cool on a rack. Eat immediately or wait to cool completely and store in an airtight container for 1-2 days (keep in mind that if they’re not completely dehydrated they may lose their crunchiness after the first day). If you have a fan oven, you can bake the squash and mushroom chips at the same time. 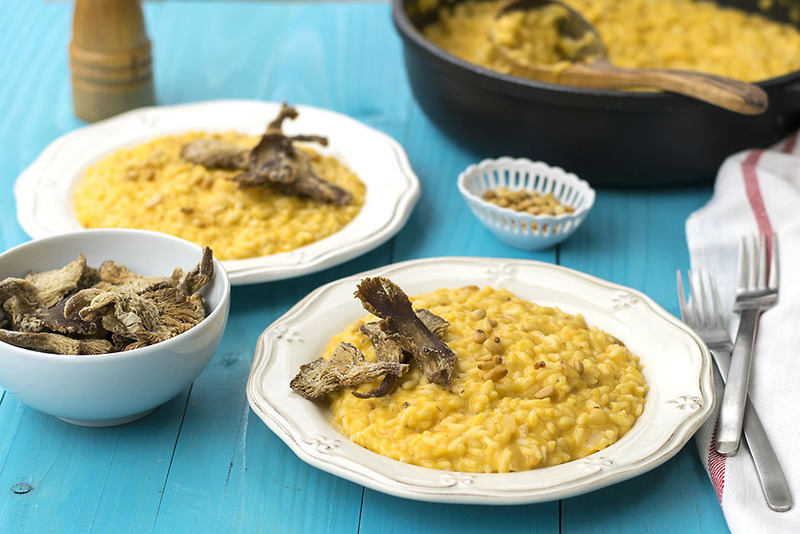 Try to use a type of rice suitable for risotto (such as arborio, carnaroli, carolina, San Andreas). Keep broth in a small pan over very low heat to have it nice and hot for the risotto. If you use pumpkin puree from a can, try to find one that says 100% pumpkin. For gluten-free mushroom chips, use corn flour or any gluten-free flour instead of regular flour. For a vegan risotto see notes at the end of the recipe! Transfer olive oil and onion to a large skillet or pot and heat over medium heat until translucent and soft (about 3-5 minutes). Add the rice, cumin, thyme, nutmeg, pepper, and salt and stir for 1 minute. Add the wine and stir until almost evaporated, then start adding the broth gradually, about 1 cup at a time, stirring quite often and waiting for each cup to be absorbed before adding the next one. If needed, reduce heat to a gentle simmer. When you have used about 6 cups of broth, add the milk and start tasting the risotto to determine when it’s ready. When the risotto is almost but not completely ready, add the butternut squash puree, the Greek yogurt, the pine nuts, and the parmesan and stir for 1-2 minutes until thick and creamy. 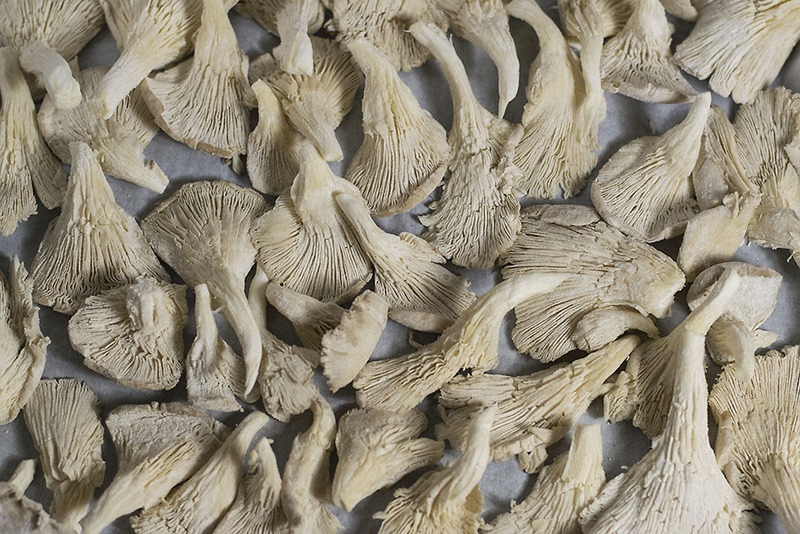 Serve immediately and garnish with some mushroom chips. To take this recipe a little bit further, you can go two ways. For a sweet touch, add 1 tablespoon brown sugar together with the squash puree. Or, for an extra savory result, top each plate with some crumbled feta cheese just before serving. I prefer the latter but the choice is yours! 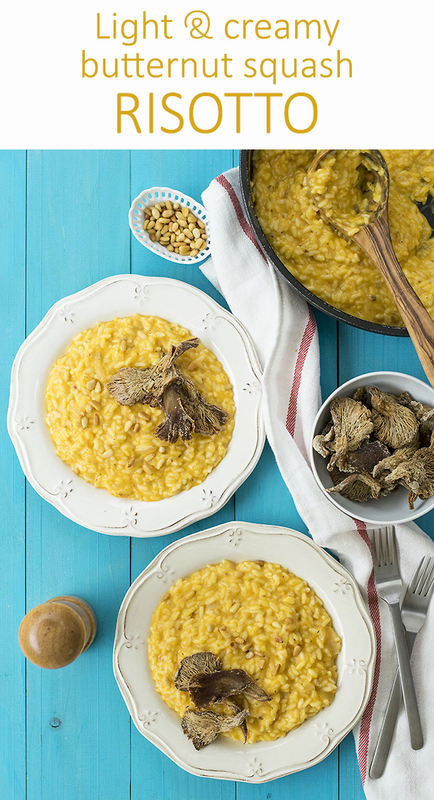 For a vegan risotto use almond milk and coconut yogurt instead of milk and Greek yogurt. Omit the parmesan cheese and add a sprinkle of nutritional yeast. Interesting, I have never tried mushroom chip before. I like the way you put the recipe in such a simple way. I LOVE risotto so much! I look forward to “veganizing” this, too. Already snapshotter the recipe and all. 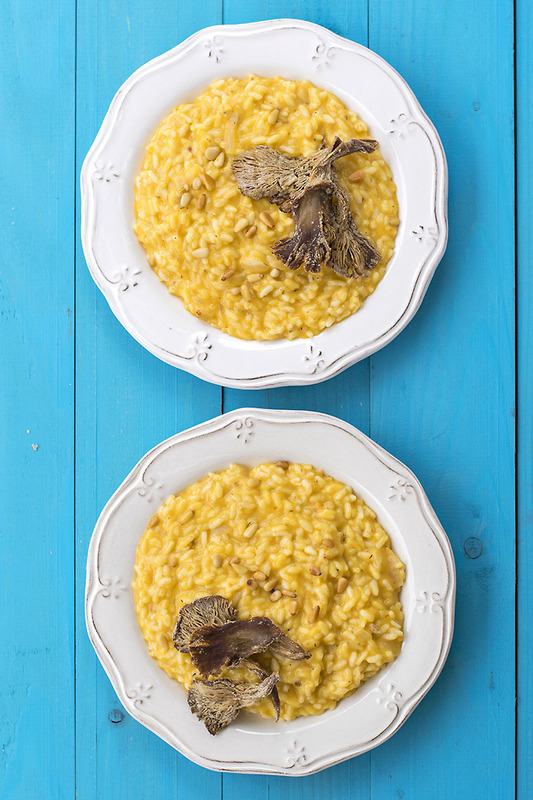 I love risotto will try this out! Wow, This looks so rich and comforting…Never tried mushroom chips before..Pinned to my list of recipes to try!